What Tumblr Triggers and Actions are Supported? New Liked Post - Triggers whenever you "like" a post on Tumblr. New Tagged Post - Triggers when a new post is created on any blog with a specific tag you choose. New Post in Dashboard - Triggers when a new post is added by someone you follow on Tumblr. New Post in My Blog - Triggers when a new post is created in a specific blog you own. Create Link Post - Creates a new link post. Create Audio Post - Creates a new audio post. Create Quote Post - Creates a new quote post. Create Photo Post - Creates a new photo post. Create Text Post - Creates a new text post. Create Video Post - Creates a new video post. Getting started with Tumblr is easy! You'll have the opportunity to name this Tumblr connection if you'd like. But that's optional and you can simply click continue. 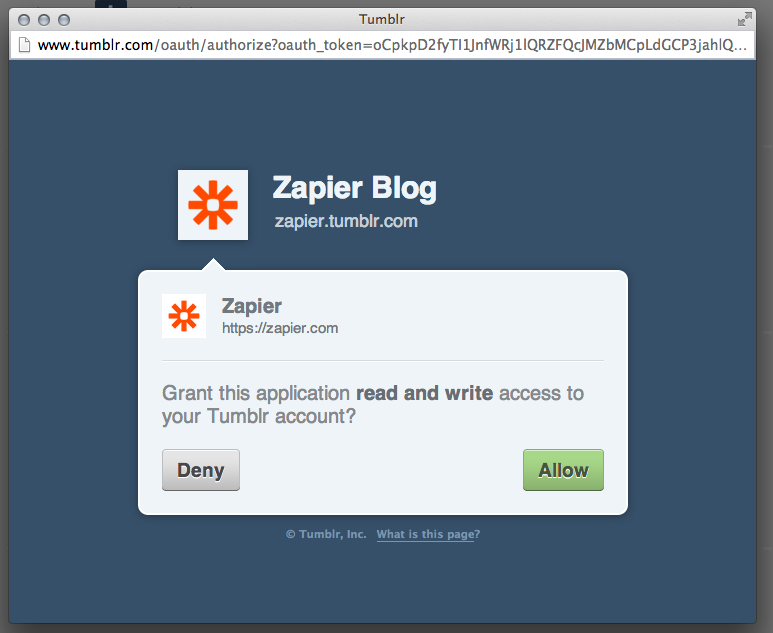 You'll be asked to allow Zapier access to your Tumblr account, shown below. After you click "Allow", you'll be redirected back to Zapier and if everything went well, you should see a screen showing Tumblr was connected successfully. And you're set! You can continue setting up your Zap.